There are some varieties of corn that seed companies advertise as being excellent for parched corn. I bought a packet to try next year. Thanks for the great comment and link. Like you mentioned there are probably better options for making parched corn than our local sweet corn. Some of the indian varieties that they sell are excellent for this. Just curious, is this made from sweet corn (what most people are familiar with) or what we call in Iowa ‘field corn’? Field corn is drier and tougher and generally used for livestock food. 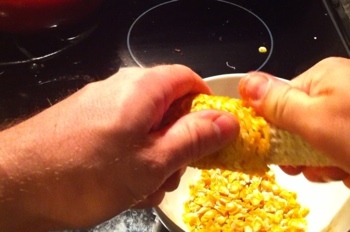 I always thought sweet corn was too soft to be used for anything but on the cob or canned. That would be a really neat way to save our sweet corn for future use. Yes, I made this from our local farm-fresh sweet corn variety. I’ve also tried it with frozen sweet corn and both have come out with good results. If you want a more authentic Pinole, try Indian Blue Corn. This is what the Tarahumara indians would use. Thanks Eric you did a great job getting this out and demonstrating the “how to”. I had the opportunity to live among the Tarahumara for a couple of years. This brought out some very practical lessons on living a simple life. Queston about what kind of corn is something to give some thought. One suggestion I picked up was using the ornamental corn that surfaces at Thanksgiving or the other types. One point to consider is that older heirloom varieties have greater protein than the newer hybrids and gmo altered varieties which have been bred for massive cabohydrate capacity to be used for making Corn Syrup and its dirivites. so if you can’t grow your own, check out your fall decoration stores or local Farmers markets for the multicolored varieties. Thanks again for the article it is a great addition to your very practical site. Thanks again for the great info. Funny you said that, I was just looking into the ornamental corns on Amazon as well as the Blue Corn (Organic Non-GMO): Organic Hopi Blue Flour Corn – 100 Seeds . Besides the protein benefits you mentioned, I read that these varieties are much more drought resistant. Wouldn’t be a bad idea to have a number of seeds on hand for an emergency crop in the future. when we make Pinole we grind it in the meet grinder by hand, and also we get dried purple corn at a mexican food market. what type of meat grinder is it? One of those hand-crank varieties? this would clearly be beneficial for off-the-grid situations. thanks! 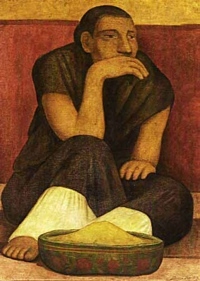 I grew up in Chihuahua and Tarahumara’s were a common site in the city. And of course, if you travelled to the mountains. I was used to eating pinole growing up and I never remember it being dangerous to eat or “swelling in the stomach.” The flavor was excellent, Tarahumara’s add dried orange peel, cinnamon and some kind of sugar, probably “piloncillo.” There might be more in it. However, I never heard of this type of pinole having chia seeds. I am trying to find the original Tarahumara recipe for pinole. By the way, the corn that Tarahumara’s use is a white “meaty” corn with large grains that is easily grown, definitely not gmo. Definitely not sweet tasting on its own, but full of flavor. I’d love to get the original recipe if you ever come across it. Chia is an excellent source of Omega 3 fats. Likely the best source you will ever find in such a small package. I take about 3 tablespoons of chia daily in my drinking water. Chia soaks up abot 10 times it weight in water in is mucilagenous gel that surounds the seeds. It’s kind of an odd texture but the swollen seeds hold onto that water as tey pass through your intestines where the fluids are more easily absorbed than in the stomach. This effects a higher yeild of hydration than gulping water directly. That said, eating dry chia can have an adverse effect on your system by pulling water from your system as it passes through. 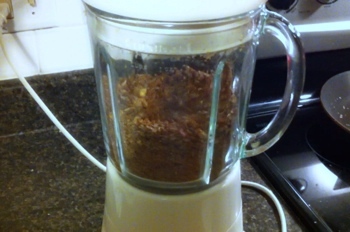 My suggestion for the pinole recipe would be to grind the chia in with the pinole flour and reap the benefits of the Omega 3 fats that the chia provides along with the corn’s proteins and carbohydrates. Instead of using ordinary corn meal, you might want to try using a product like Maseca. It’s my understanding that for the “corn meal” traditionally used, the (field) corn kernels are actually treated with lime (mineral), which makes some of the corn’s nutrients (eg. Niacin) more bioavailable. 2 thumbs up on the Chia! When rehydrated in a glass of water, it has a consistency that makes you think you’re drinking frog’s eggs from the pond, or bubble tea. I like to mix 1c water, 1T chia seeds, 1T Tang sugared instant orange drink powder. It’s not quite authentic “chia fresca”, but I find it to be a tasty and stomach-friendlier alternative. Thanks for the tip dk. I’ll have to look for Maseca. Do you know a good place to purchase it from? Do this google search on Maseca and you’ll see what I mean. It’s in every grocery store, right next to the sacks of flour and sugar. It’s just rough-ground (and limed) corn flour, like they use for tortillas, “chi chi’s scoopable corn cake”, etc; I think it was around $4 for a 4-lb bag. After making several batches of pinole, I decided I like using 1/2 packed cup dark brown sugar (per 2c cornflour) in place of the honey, and orange zest / cinnamon to jazz it up. In a big cereal bowl, put 1/2 cup pinole, add about 1.5 cups boiling water, stir well; makes a good breakfast that keeps me filled up til lunchtime. I’m an incorrigible snacker, so I find it interesting that I don’t have nearly the same snack urges during this time, nor do I feel stuffed full. Thanks again for the great comments and recipes. I’ll definitely be trying it out with Maseca. There is one aspect of your recipe that I find VERY ALARMING, but EASILY AMENDED. What I’m getting at is that you recommend NONSTICK cookware, then prescribe HEATING the EMPTY PAN thing. 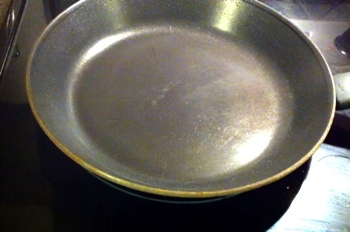 This procedure will result in releasing gases from the nonstick. For most of us Homo saps these gases will not even cause discomfort, but BIRDS ARE EXTREMELY VULNERABLE TO CHEMICALS IN EXTREMELY SMALL AMOUNTS, so this procedure could leave pet birds (even in another room or on another floor of the house) dead in seconds. Other pets can also take harm, especially small ones, but birds of all sizes are the most likely to succumb. Most bird keepers I know have stopped having nonstick in the home at all, to avoid any accidents of this sort. Adapting your good recipe only requires focusing on cast-iron instead of the hi-tech utensils. I’ve eaten Pinole since I was a child. But only remember it being made of wheat. 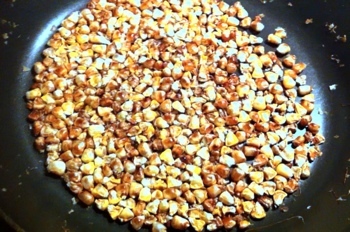 I still make it today by roasting the kernels in the oven then grinding. I enjoy it as a drink or as a thick mush. Both my folks came to this country from Mexico and pinole is for sure made from corn not wheat.I grew up in the 50s eating wonderful pinole made from scratch and ground on a stone Metate just as it was done in the old country. Actually pinole is made by simply grinding popcorn into a powder like consitancy and adding water or milk with sugar to drink. my family makes it. I actually recommended buying big packs of popcorn kernels at your grocery store, pop your corn ,grind down the popcorn and you’re set, the powdered popcorn is great to carry on a hike as it weighs nearly nothing and is nutritious. Ok this is an odd question. How would you package it for long term storage? I want to put this into my bug out bag and in my regular food storage for long term. What would you recommend? I seriously love your site btw. It has been amazingly helpful. I would vacuum seal it using something like a FoodSaver (can be found at walmart). Also, putting it in a small Mylar bag with an O2 absorber will also do the trick. It sounds like you may be referring to hominy. Which is essentially corn processed with lime (alkaline mineral) to make the nutrients more bio-available. I originally found out about this super food in Horace Kephart’s “Camping and Woodcraft” from 1906. It has similar recommendations and even mentions some woodsmen using roasted rolled oats. HK was a meticulous documenter of “campaigning” provisions and pinole was among his most highly regarded food stuffs.